Déco claire, pierre nue, quelques touches de design et des cocktails servis bien frais ! A la Briciola, l’ambiance est très « famiglia » et la pizza très « Napoletana » Tout est fait maison et les produits rigoureusement sélectionnés font la différence : jambon de Parme AOP, basilic, tomates cerises et légumes livrés quotidiennement, mozzarella di bufala de Campania ou délicieuse burrata des Pouilles de 250 g... Les « pizze bianche », sans sauce tomate, sont garnies de roquette bien fraîche, les classiques rouges se déclinent en calzone et en spécialités régionales. Chaque jour une pizza, une « pasta » et une salade sont proposées sur l’ardoise. Et, pour les gros appétits, un tiramisu bien crémeux ou un affogato al caffè. Cocktails (8-9 €), dont le désormais classique Spritz, vins de toute la péninsule, prosecco « superiore » DOCG (6 €), bouteille de Lambrusco « vecchio moro » à 24 €. Pizze 10,50-15 €, pâtes 13 à 15 €, planches de charcuterie 13 €, assortiment de fromages 9 €. This pizzeria is among the best in Paris. Don't forget to try the dishes of the day, which are always surprising and never disappoint. There's a lovely family vibe here, and the staff is great. Don't hesitate to come with kids (the kids' pizza is shaped like a bear!!!) and enjoy a great meal here. We go here every time we come to Paris and every time it is wonderful. Friendly staff, good food and nice atmosphere. Delicious food, great friendly service!! Nice restaurant and good location. Pizza was good. Excellent. Service was attentive and friendly. A must try restaurant. best pizza I've ever had. Entire family happy with dinner choice. We enjoyed our dinner at La Briciola so much! The staff were so friendly, the food was excellent and great atmosphere too! Highly recommend this restaurant! Terrific pizza-- great tasting dough, thin bottom, but generous crust, well shaped and perfectly baked in the wood burning oven. Toppings were great. Marinated vegetable antipasti had perfect variety (eggplant, peppers, artichokes, tomatoes, eggs, rugola and more) very nicely seasoned and house-marinated. Excellent!! We found some rave reviews on this place, so we had our "Friday night pizza" here while in Paris. The pizza was VERY good, just the way we like it. La Briciola is a fun place, comfortable, and great friendly service. 6 of us met for our first dining experience here tonight. Their pizza was very good. I had a marinara, with garlic and oregano. Only problem was cutting it. They don't cut it into slices, and it was very difficult for all of us to cut. Excellent desserts: I had strawberries w balsamic vinegar and mint: yum!. Great ambience. They also have a children's menu, which was appreciated. Would go back. Great pizza in a warm and welcoming local restaurant, very reasonably priced. Worth booking as it was packed the Saturday evening we went. Highly recommend. Used to be my favorite pizzaria so I was happy to bring my four friends here, only to leave very disappointed. The pizza was ok (though it would have been nice to have some pasta's on the menu as well), but the service was horrible. Everything was rushed to the point that it was just plain rude and after dessert (just 1 hr after we arrived) the check was thrown on our table before we were able to order some more drinks. When we told the server we weren't ready to leave yet she responded a group of 10 eaters was waiting for a table and we would have to move to the bar. Insane, especially since I made reservations. That last drink was on the house, but our night was ruined. Some proper communication would have helped a lot, I'm not coming back. Fred & Philippe are the consummate hosts at this fantastic corner resto. Yes, it's 'the real deal'. The pizza is authentic thin crust; the salads are simple and, therefore, perfect. The wines are well chosen and well-priced (Italian). 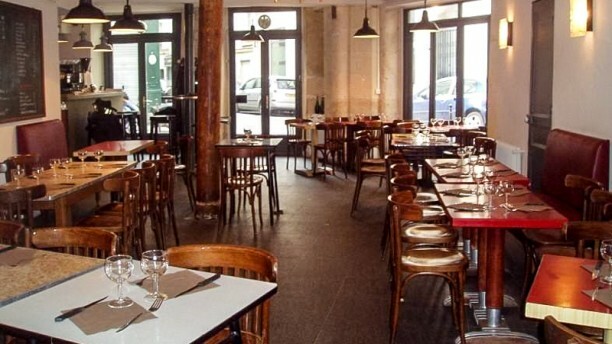 This a wonderful, local restaurant and we frequent it weekly when in Paris. Walked in after a year's absence; felt like home. Honest people, honest food and fair prices. We eat pizza in many, many places and their pizza strikes an exquisite balance of sauce, crust and cheese.